What are we to think about giant lightning bolts to space? Can we think of space as neutral or empty in the face of these spectacular discharges? The pilots who saw it wouldn’t talk about it for fear of ridicule or worse. The pilots whose airplanes were hit by it wouldn’t talk about it because they were dead. Then in the early 1990s investigators began to take the rumors seriously and to look for evidence of lightning above the clouds. Right away they found images on archived satellite pictures, and they recorded hundreds of flashes above distant storms. Giant neon-light-like haloes would appear 85 kilometers above storms. The glows would propagate downward to form red balloons of interlaced filaments. The currents would squeeze into 30-meter-wide channels scattered over areas of a hundred square kilometers and disappear into the clouds. The glows were so diffuse that they seemed hardly a danger to airplanes. The investigators named them “sprites”. The investigators soon discovered another form of lightning above the clouds. 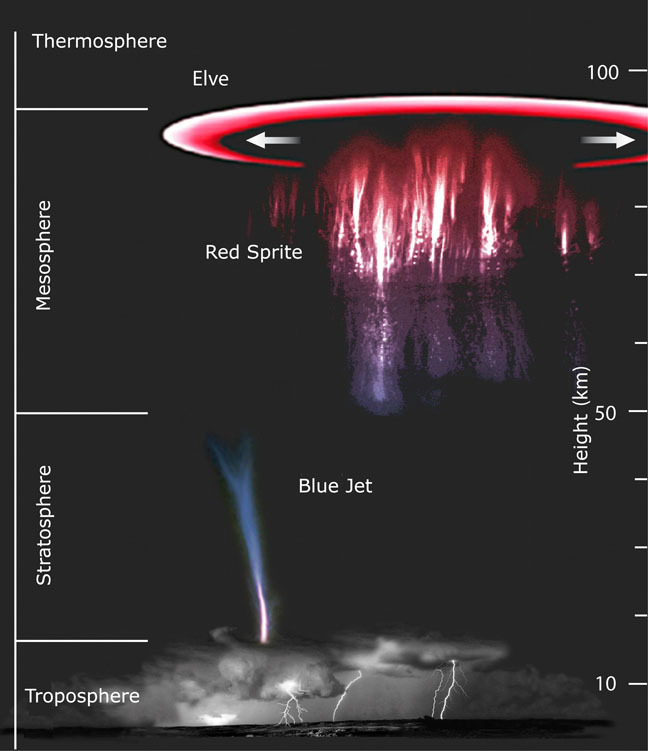 “Blue jets” would spout upwards from storms as much as 15 kilometers toward space. Several giant jets shot up to 80 kilometers. The jets were more compact than the sprites. And under the clouds the investigators documented extraordinary strikes of “positive” lightning. These bolts were six times as powerful as ordinary “negative” lightning, and they lasted ten times as long. Where ordinary lightning could punch a tiny hole in a wing, positive lightning could burn through struts and wires and rip pieces apart. These bolts carry forces many times greater than what airplanes are designed to withstand. In one crash, rivets had been melted. In another, a pipe had been crushed and twisted. Crash specialists suspected these planes had been brought down by strikes of positive lightning. Investigators finally were able to correlate their observations. 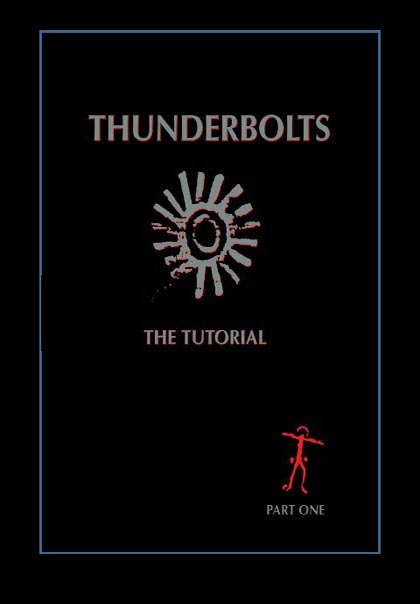 They realized that every time there was a sprite above the clouds there was a bolt of positive lightning below the clouds. The sprite and the positive bolt were parts of a single discharge that stretched from space to the Earth’s surface. Sprites and jets and positive bolts are common. Now that scientists have stopped believing that such phenomena are impossible, they find them in old photographs. Pilots are talking about seeing sprites since they began to fly. Certainly there is a cultural bias: People tend to disbelieve anything that is unfamiliar. And there is likely a sensory bias: Humans have no sensory organs that detect electric and magnetic forces, and they tend to believe that if they sense nothing, nothing is there. There is also a theoretical bias: Without a theory with which to understand an observation, we tend not even to perceive it. Believing in a theory that already explains a phenomenon will turn your attention away from discrepancies and anomalies associated with that phenomenon. 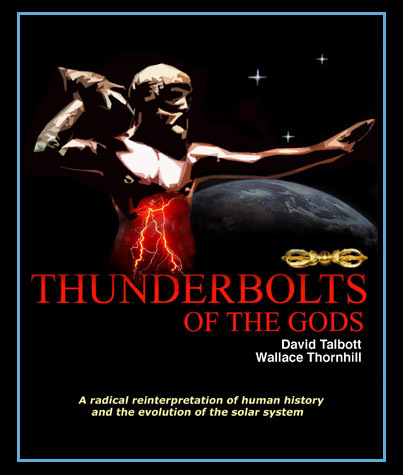 Recognizing the megalightning connection between Earth and space opens consideration of other possibilities. Perhaps the current between Earth and space is part of a larger circuit. Perhaps the storms don’t generate the lightning but the lightning generates the storms. Venus, after all, has extensive lightning, more powerful lightning than on Earth, and it has an atmosphere of smog: Lightning in smog contradicts the thunderstorm theory of lightning generation. Perhaps lightning also powers the wind. Neptune has the strongest winds of any planet in the Solar System, yet it is farthest from the Sun and its heat: Cold gales contradict the thermal model of air movement. Perhaps hurricanes and tornadoes and even dust devils are electrical vortices. Only recently have investigators thought to look for electric fields in dust devils—and have found quite strong ones. Astronomers are trying to explain the spokes and waves and movements of Saturn’s rings with the familiar theory of gravity, but even if they succeed they will have ignored the pervasive influence of electrical currents in the Solar System. The explanations will be merely instrumental, accounting for the familiar aspects but oblivious to the ground from which those aspects arise. Such an instrumental theory can be a dangerous thing when it has more practical applications: The tethered satellite experiments ignored electricity in space and likely resulted in the sparking and burning through of the tethers. The space elevator program will bring the full voltage of this oversight down to Earth. And let us not forget the image of the shuttle Columbia on its last reentry being chased down by a bluish-red corkscrew of what may have been a bolt of aircraft-destroying megalightning.